"Charles Linn, retired Swedish sea captain turned banker and industrialist, acquired machinery from the defunct Irondale furnace operation and established the Birmingham Foundry and Car Manufacturing Company, later widely known as the Linn Iron Works." These are located at the right edge of the view, north of the railroad and west of 14th Street. The L&N Railroad played a significant part in the development of Birmingham, investing and providing rate concessions to start up industries. 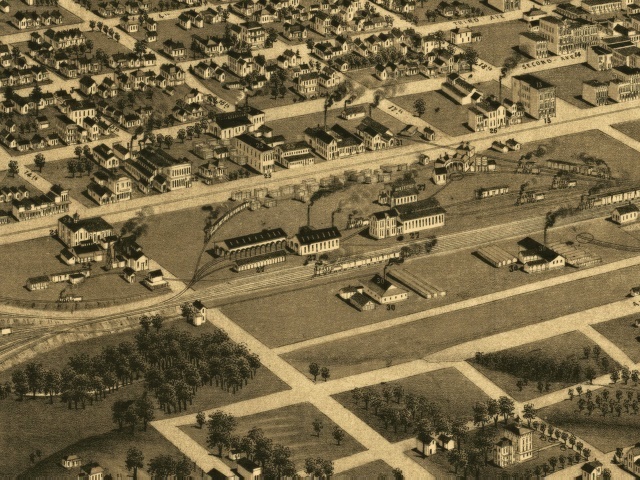 The railroads initial shops were located as shown here, east of 14th Street and north of the railroad reservation. Notice, based on the quote above, how the railroad and the new industries, seemed to play off one another. Linn Works is noted as a car manufacturing company, and all of the products of the new industries would, of course, ship by rail. There were no highways!